Saptarshi Prakash leads the design of Consumer Products at Swiggy, India’s largest food ordering and delivery platform. He has also worked with startups like Housing.com, Zeta and other companies around the world. To this, I often reply savagely, “You start with Physics”; scaring away most of the seekers. But here is the thing — someone who is genuinely interested never stops with a single query. They follow up with questions after questions after questions. I love them! Every week, I have slots blocked on my calendar only for the purpose of mentoring such enthusiastic people. I either meet them in person (if they are around Bangalore, India) or speak to them over the internet. I like doing it. 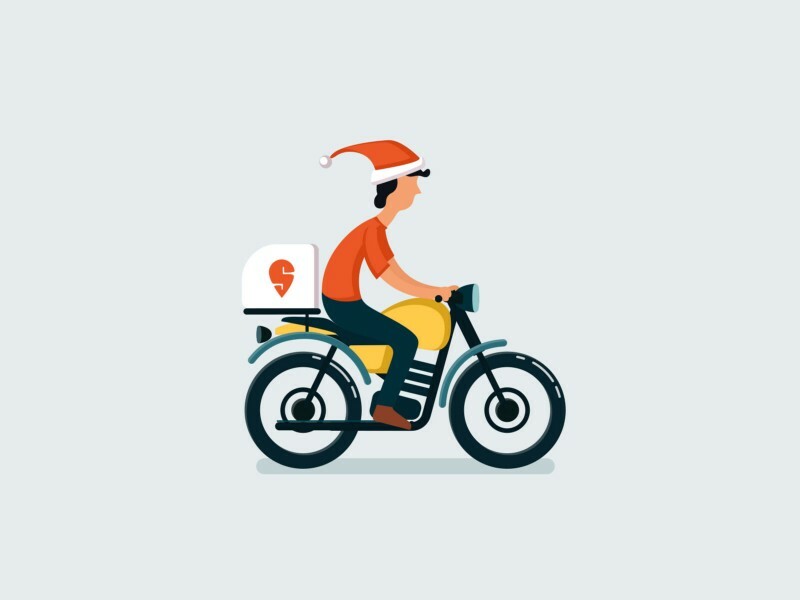 Here is Snehal Patil’s representation of a Delivery Executive riding his bike, while wearing a Santa Cap. Cute, isn’t it? I have identified 5 simple additions that will make this static illustration come alive. Let’s get started! Rotation is simple! There is a ‘rotate’ option in After Effects and we simply add 2 keyframes a few seconds apart, with different values of angles. Then, we move the entire assembly of the chassis, wheels & the rider forward by a distance of 2(π)r, for every complete rotation of the wheel, as suggested by the laws of nature — phew! Else, we can simply skip all these complications and try some effortless yet sophisticated technique. How about this? Even if we assume that the bike is plying on a smooth tarmac road (fairly unlikely in India), there will still be a rhythmic up-and-down motion because of the shock absorbers. Something like this. Do you see the additional movements here? If you do, then you have a designer’s eye. These bits are very subtle but they add a lot of life to the composition. They clearly differentiate the lifeless food-box from the human, full of life. We all know that a Santa Cap has a loose end and when the rider is riding at high speed, it can never be rigid; It needs to flutter! So here we go. This step of fluttering the cap is highly addictive and you may feel very tempted to overdo it. In fact, I too overdid it! But hey… controlled exaggeration is allowed. PRO TIP: The fluttering is done by simply morphing the cap from one shape to another within a short span of time. It is much easier than it looks! We simply introduce a city scape and move it behind — Something that we learned from the computer games like Roadrash, Mario and Contra. Relative motion, you see. PRO TIP: It is very easy to create a forever looping background like this. You just need to have 2 copies of the same instance and stack them back to back. Finally, reveal only that section of the composition which forms the infinite loop. Saptarshi Prakash – Saptarshi Prakash leads the design of Consumer Products at Swiggy, India’s largest food ordering and delivery platform. He has also worked with startups like Housing.com, Zeta and other companies around the world.